« Where Have You Been? This entry was posted on Saturday, June 15th, 2013 at 12:30 and is filed under Amnesty, Bush Clan, Featured, Illegal Immigration, Immigration, News, Politics. The particularly egregious use of the term “fertile” aside, what Bush is here saying confirms every word I have alleged: This wave of immigration they’re now pursuing is intended to prop up our welfare state. Bush, like his brother and father before him, doesn’t have any intention of slowing the growth of government, but merely wishes to increase the revenues available to it. That’s it. That’s all there really is to this, and all there’s ever been to this, and notions like assimilation go careening out the window. There will be no border security, and no effort at assimilation, but instead a patently shrewd attempt to pad government revenues with the labor of young, “fertile” people. I wonder if prospective immigrants understand, either waiting lawfully in line, or trying to short-cut around it, that all of this talk about compassion and coming out of the shadows is really about them taking on the yokes of beasts of burden, with nothing more or less than their ability to drag this nation along through the mire of the welfare state as as the object. As if this isn’t bad enough, Marco Rubio now explains that we need the immigrants as new, legalized employees to pay the taxes that will fund border security. If you have had any misunderstanding about the motives of this entire “immigration reform” bill nonsense, this must clarify the matter: It’s about funding the leviathan that has become our federal government. People who are less politically-engaged frequently ask me what is the difference between a Republican and a Conservative. While the explanation is certainly worthy of an article or two all its own, the simplest way to view it seems to be that conservatives concern themselves with principles of right and wrong, while Republicans concern themselves only with how to make a thing work in a very pragmatic, morality-agnostic manner. It doesn’t matter to Jeb Bush why existing Americans have a lower fertility rate than recent immigrants. It doesn’t matter to him why it is that they create fewer new businesses than recent immigrants. He merely accepts it as is, and then looks for a way to fill the short-run or mid-term gaps, consequences be damned. Since pinheads who call themselves “Republican” seem not to understand why Americans would slow their rate of reproduction, or why they would create fewer businesses, let me make it perfectly clear: People like Jeb Bush and his family are the reason. Rationally, once invested in life in America, it’s rather more difficult to decide to have more children if each successive child adds a substantial burden that may affect the prospects of each existing child. When my own daughter was born, Mr. Bush’s father was President, preparing to break his “read my lips” pledge. The economy was doing poorly, and this acted to shake up our view on whether it was proper to bring more children into the world. We wondered if we wanted to bring more children into a world in which they would become beasts of burden for a welfare state George H.W. Bush’s OMB director at the time projected that the net tax rate on children born in 1990(like our daughter) would wind up being around eighty percent! Why did we have only one child? We couldn’t afford two! Immigrants don’t realize this yet, because they’re unaware of the nuts and bolts of our escalating welfare state from the paying side, at least initially. Over time, they learn it, as their rate of reproduction or business creation likewise slows. As they struggle to make a little ground against the economic forces weighing down upon them, they become disinclined to add new economic burdens to their own family situations. Reproduction slows. What Bush and those like him are gambling is that a new sea of immigrants freshly legalized will still be too poor, too uneducated, and too busy to notice this until they’ve created another generation or two of workers who will struggle to fill the coffers of government. What Mr. Bush and those like him will not do is to consider why our existing population’s reproduction rate has slowed to below replacement. What Mr. Bush will not concede is that finding new ways to fund the welfare state is not the answer. It doesn’t need more funds. It needs to be demolished. The problem is that as people obtain slightly more prosperity, they tend to focus on how to maintain and extend it. Part of obtaining that prosperity is education in one form or another, and all of these things lead people to slow their reproduction. These things tend to make them more risk-averse, so until they cross another significant threshold, starting a new business venture is also unlikely. What Jeb and the other members of his family(both real and political) wish for us to believe is that there is something innate about immigrants that makes them more “fertile.” What they are unwilling to admit is that the problem isn’t with the “fertility” of existing Americans, except that in a struggle to maintain their standard of living, they have policed themselves, unless they are captive client-members of the welfare state, in which case, they’re another burden for the rest of us to carry. Even if one is able to rationalize Jeb’s views as merely misguided pragmatism, one must confront the fact of how he views people. Bush, like his brother and his father, seems to hold a worldview that permits him to see the issue as one of how to fulfill a need to keep the beast alive. The fact that the beastly welfare-state is destroying the country is a matter of little significance if he can find enough human lubricant to keep its wheel turning a while longer. Generations of Americans struggling against the growing weight of the state are of no consequence to him. Lives of real people demolished in the process of building the leviathan are of little or no concern. Neither his view of native-born Americans nor the legions of waiting immigrants offers any comfort when considering the future he envisions, in which the state continues to escalate as a burden upon the populace. 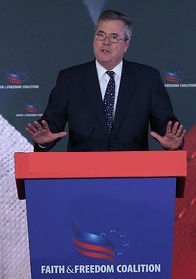 Some number of years into the future, Jeb Bush and those like him will appear before us to try to give us the next round of amnesty. By then, the country will be in crippling poverty with few exceptions. Civil strife will be rampant. The welfare state will reign supreme in all aspects of life. The problem with his view is that he’s more interested in making it to that next occasion than he is in preventing it in the first place. If you really wonder about the difference between a Republican and a Conservative, this then may serve as the key: Republicans don’t make waves, and go along with the flow because they wish to maintain the status quo indefinitely. Conservatives know it cannot last. I’m a devout, God-loving, gun-toting Conservative, but I’m about tired of the Bush’s. Compared to this president, they are nearly Jeffersonian, but they don’t have the Constitution’s best interests at heart which means they don’t have ours. Jeb Bush should come to Alaska. 18 child families are not uncommon. Perhaps it is Federal Policy that discourages LIVE BIRTHS that is the problem? Chris, You bet. That is the thing the establishment Republicans never wish to answer. How the heck did you get the Stones to play on this story?You just might start a trend here for bloggers!